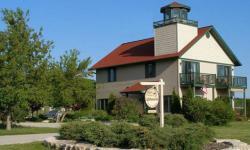 Delight in the warm homey atmosphere of the Door County Lighthouse Inn BandB filled with Lighthouse decor located in Egg Harbor, Wisconsin. Along with the Door County Lighthouse Inn BandB we have a great retreat at the Awesome Sunset Condo perched above Egg Harbor with a beautiful view of Egg Harbor and awesome sunset view over the waters of Green Bay. This great 2 bedroom, 2 bath Condo also has a Pool nestled in the hillside. 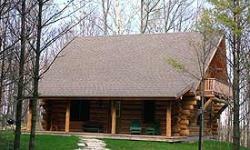 So the B&B for your couples getaway and for families we have the Awesome Sunset Condo and the Pinecrest Log Cabin. Cana Island Lighthouse Room and Eagle Bluff Lighthouse Room - Both rooms are second floor bedrooms each having their own fireplace, TV/VCR/DVD, queen size bed, down pillows, private bath, double whirlPool tub and outside deck. Sherwood Point Lighthouse Room -A first floor bedroom with king size bed or 2 twins for separate sleeping, down pillows, TV/VCR/DVD, private bath with shower, and outside deck. Baileys Harbor Range Light Room -Second floor bedroom with fireplace, queen bed, down pillows, TV/VCR/DVD, private bath with shower and out- side deck. Potawatomi Lighthouse Room - Second floor bedrooms with queen size bed, down pillows, TV/VCR/DVD, private bath with shower and outside deck. Awesome Sunset Condo - This beautiful 2 bedroom, 2 bath Condo is located on the ledge over looking Egg Harbor and the sunset shore of Green Bay. Above the village where cool breezes blow and you can enjoy the view and also have access to a Swimming Pool. 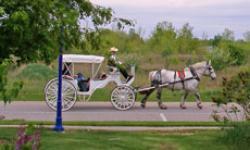 A romantic getaway in beautiful Egg Harbor, Door County, Wisconsin. 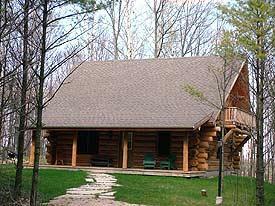 This hand crafted cabin, built in 2000, will provide memories that will stay with you for years. 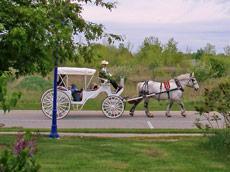 Built at the edge of the Village of Egg Harbor, you will be minutes from the water and shops. Walking paths through Eames Farm puts Nature at your door step. For the outdoor sports enthusiasts, the opportunities never end. You can bike or hike through the miles of trails in nearby Peninsula State Park, GOLF at one of the areas many courses, take to the waters in a rented sail boat, Fishing boat, or swim at one of the numerous Beaches. Woods, trails, and water surround you beckoning to be used in every season. For those seeking a more relaxed pace, Door County is famous for its art galleries, antiques, and immense variety of speciality shops and restaurants.